Choosing your beach chairs could be the biggest decision you make all day. Being in the kitchen doesn't mean missing out on the views. It's a straight shot. Don't want those songs from the kids' movie stuck in your head all day? Grab your tablet and sit outside. Cross the boardwalk and you're there. And that means more space for toppings on make-your-own-sundae night. Located on over 300 feet of beach. Indian Bayou Golf Club is just 1.3 miles away. 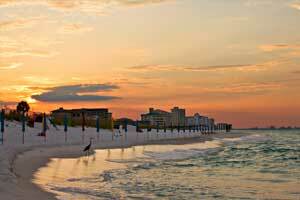 24 minute walk to Gator Beach, 11 minutes to Big Kahuna's Water Park and The Track Destin is just 3 minutes away. Sterling Sands is where you and the beach get reacquainted – and that takes time, so plan to spend as much of the week as possible lounging seaside. The eight-story mid-rise faces 300 feet of pristine, never-crowded oceanfront, with nothing but a pool and short boardwalk in between. Stake out your turf and flip front to back in even intervals to perfect that golden glow, all while keeping a watchful eye on your buried treasure hunters who can’t seem to get enough of the sand shovel. When you start getting questions about dinner, head back to your condo to take inventory of the fridge. Spacious vacation rentals include living/dining areas and full kitchens, plus inviting balconies overlooking the water. Outside, there’s a covered grill area, so you may decide to appoint a grill-master and fire up dinner al fresco. The fitness room will have to wait, because as soon as you get back from dinner, your crew will be grabbing towels and asking to go out to the hot tub – a wish easily granted. Later, speed up bedtime with promises of a trip to Big Kahuna’s Water and Adventure Park for everyone who’s sawing logs by 9:00 PM. - Front desk is open 9:00 AM-5:00 PM daily. Guests that are planning to arrive after hours must contact the property in advance using information on the booking confirmation to receive codes to lockboxes located outside the front desk. - The individual making the reservation must be 25 years of age or older and must occupy the rental property the entire term of the reservation. Singles under 25 years of age are prohibited unless accompanied by a parent or legal guardian. Restrictions may apply regarding the number of people that may accompany a parent or legal guardian. - During the spring break vacation period, the age policy will be strictly enforced and identification of all guests will be examined at check-in. If guests are not 25 or older, the full amount of stay will be forfeited; no refunds. Occupancy limits in guestrooms are strictly enforced. Chaperoned groups are prohibited. - Guests can receive detailed instructions or Spring Break Security Deposit information by contacting the office using the number on the reservation confirmation received after booking via this Web site.